Zeya is sedated after zoo patrons spot her outside her enclosure. Courtesy | Hogle Zoo Zeya, the Amur Leopard briefly escaped her enclosure at Hogle Zoo Tuesday June 7, 2016. Courtesy | Hogle Zoo Zeya, the Amur Leopard briefly escaped her enclosure at Hogle Zoo Tuesday June 7, 2016. Courtesy | Hogle Zoo Zeya, the Amur Leopard briefly escaped her enclosure at Hogle Zoo Tuesday June 7, 2016. Trent Nelson | The Salt Lake Tribune Patrons wait to be admitted to Hogle Zoo in Salt Lake City, Tuesday June 7, 2016. An endangered leopard escaped the enclosure late Tuesday morning, but no injuries were reported and the beast was soon cornered by staff and sedated. Trent Nelson | The Salt Lake Tribune Patrons wait to be admitted to Hogle Zoo in Salt Lake City, Tuesday June 7, 2016. An endangered leopard escaped the enclosure late Tuesday morning, but no injuries were reported and the beast was soon cornered by staff and sedated. Trent Nelson | The Salt Lake Tribune Katie Boender is interviewed at Hogle Zoo in Salt Lake City, Tuesday June 7, 2016, after an endangered leopard escaped the enclosure. No injuries were reported and the beast was soon cornered by staff and sedated. Boender's son Joseph at lower left. 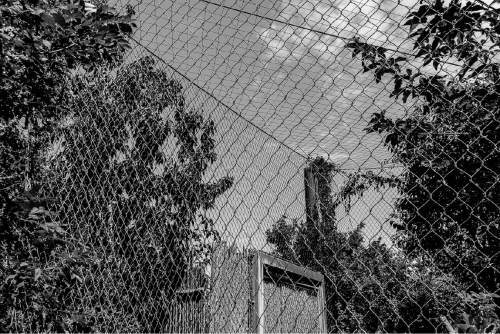 Trent Nelson | The Salt Lake Tribune The leopard enclosure at Hogle Zoo in Salt Lake City, Tuesday June 7, 2016, after an endangered leopard escaped the enclosure. No injuries were reported and the beast was soon cornered by staff and sedated. 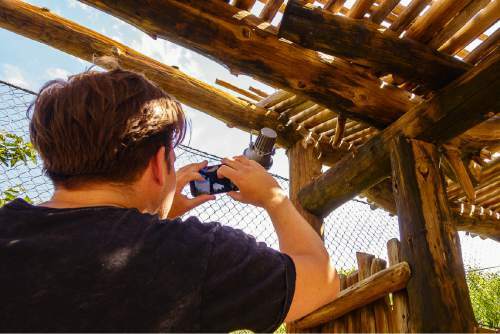 Trent Nelson | The Salt Lake Tribune Sander Jones takes a photo at the leopard enclosure at Hogle Zoo in Salt Lake City, Tuesday June 7, 2016, after an endangered leopard escaped the enclosure. No injuries were reported and the beast was soon cornered by staff and sedated. 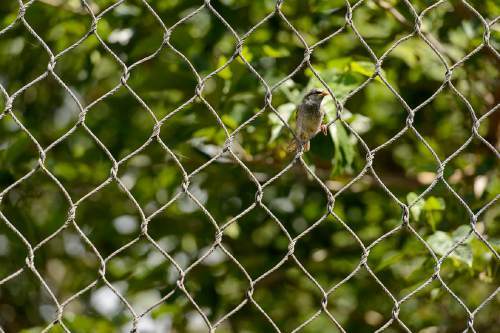 Trent Nelson | The Salt Lake Tribune A bird sits in the fencing of the leopard enclosure at Hogle Zoo in Salt Lake City, Tuesday June 7, 2016. An endangered leopard escaped the enclosure late Tuesday morning, but no injuries were reported and the beast was soon cornered by staff and sedated. 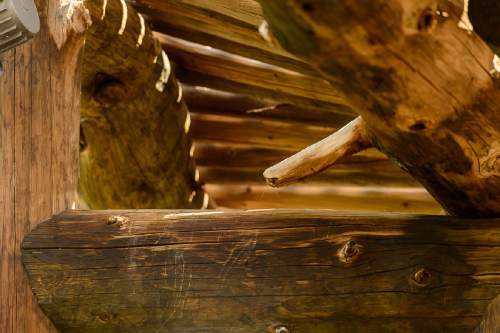 Trent Nelson | The Salt Lake Tribune Scratches mark a wooden beam where a young mother spotted an escaped leopard at Hogle Zoo in Salt Lake City, Tuesday June 7, 2016. An endangered leopard escaped the enclosure late Tuesday morning, but no injuries were reported and the beast was soon cornered by staff and sedated. Trent Nelson | The Salt Lake Tribune Scratches mark a wooden beam where a young mother spotted an escaped leopard at Hogle Zoo in Salt Lake City, Tuesday June 7, 2016. An endangered leopard escaped the enclosure late Tuesday morning, but no injuries were reported and the beast was soon cornered by staff and sedated. Trent Nelson | The Salt Lake Tribune Hogle Zoo spokeswoman Erica Hansen is interviewed in Salt Lake City, Tuesday June 7, 2016, after an endangered leopard escaped the enclosure. No injuries were reported and the beast was soon cornered by staff and sedated. 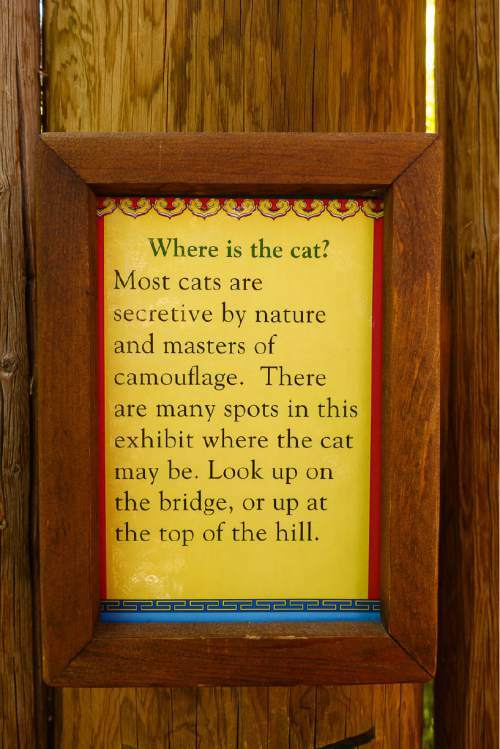 Trent Nelson | The Salt Lake Tribune A sign at the leopard enclosure at Hogle Zoo asks, "Where is the cat?" after an endangered leopard escaped the enclosure. No injuries were reported and the beast was soon cornered by staff and sedated. Boender's son Joseph at lower left. 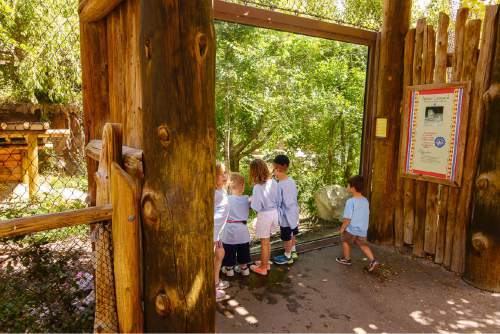 Salt Lake City, Tuesday June 7, 2016 Trent Nelson | The Salt Lake Tribune Children at the leopard enclosure at Hogle Zoo in Salt Lake City, Tuesday June 7, 2016, after an endangered leopard escaped the enclosure. No injuries were reported and the beast was soon cornered by staff and sedated. 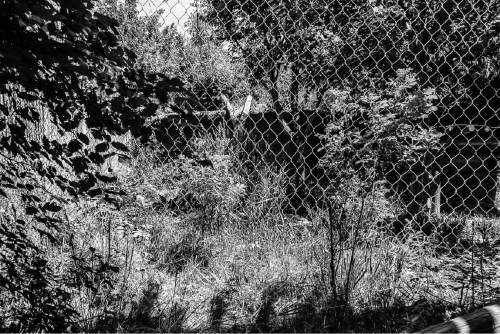 Trent Nelson | The Salt Lake Tribune The leopard enclosure at Hogle Zoo in Salt Lake City, Tuesday June 7, 2016, after an endangered leopard escaped the enclosure. No injuries were reported and the beast was soon cornered by staff and sedated. 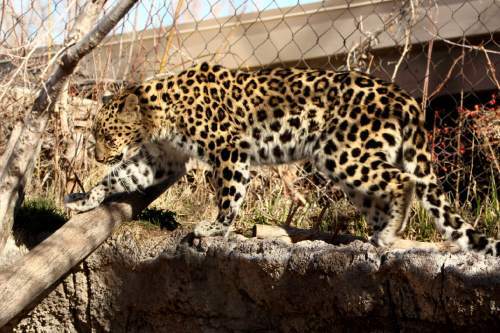 An Amur leopard escaped its enclosure and was found lounging on a shade structure above the viewing window for its habitat Tuesday at Salt Lake City&apos;s Hogle Zoo. A woman with two children noticed the leopard outside its wire mesh enclosure in the "Asian Highlands" exhibit and alerted the cat&apos;s zookeeper about 9:30 a.m., said Erica Hansen, zoo spokeswoman. Visitor Coleen Jennings said she was approaching the leopard area when the woman approached her and said: "I think I just saw an animal out of its cage. Is there a zookeeper around here?" Jennings waited while the woman found a zoo worker. The three women, children in tow, rounded the corner and saw the 60-pound cat lying on a rafter in the shade structure. "She didn&apos;t say what kind of animal," Jennings said. "If she had said it was a leopard, I wouldn&apos;t have kept walking." The 4-year-old leopard, named Zeya, appeared not to notice the approaching people and remained still on the beam as Jennings and the others slowly backed away. 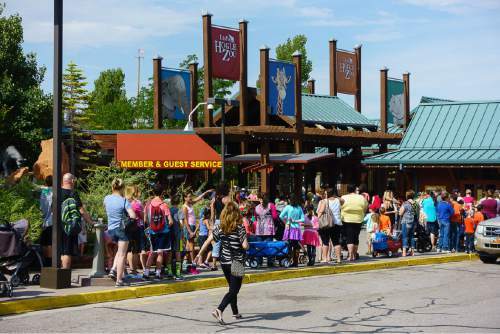 Jennings and the other zoo visitors spent the next hour indoors as the zoo locked down for "Code Houdini"  the notice alerting staff that an animal has escaped. Zeya was sleeping on the beam, about a foot from her enclosure, when a security team arrived and fired a tranquilizer dart at the cat. 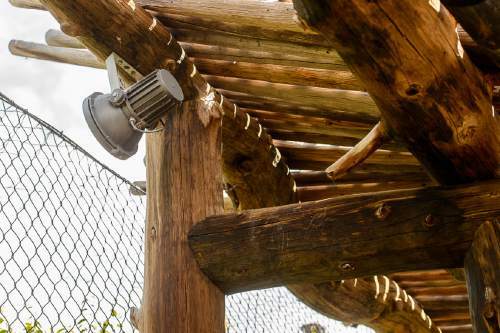 Zeya woke up and began to fall from the beam, which was about 10 feet above the ground, said zoo veterinarian Nancy Carpenter. Zeya grasped the beam with her front claws, dropped to the ground and fell asleep again under sedation, Carpenter said. No people or animals appear to have been injured by Zeya, who was asleep and was believed to be healthy on Tuesday afternoon, Hansen said. Zoo staff were investigating the enclosure to learn how Zeya escaped; no break in the wire mesh was immediately visible, and crews likely will not know for another day where Zeya exited the enclosure, Hansen said. The cat previously was seen by zookeepers in her enclosure at 7 a.m., Carpenter said. Investigators don&apos;t know what time she left the enclosure, or where she went before falling asleep on the beam. Animals that escape captivity often find themselves uncomfortable in unfamiliar territory and do not stray far, Hansen said. However, Carpenter said, not every animal is as relaxed as Zeya was. 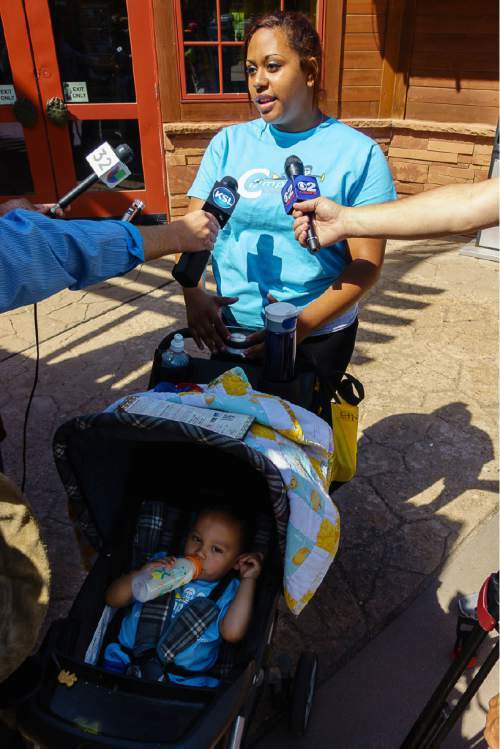 "I don&apos;t think it was stressful [for her] because she was asleep when she was darted. Normally it can be very stressful," Carpenter said, noting that a pursuit over a distance could overheat and dehydrate a big cat quickly on a hot summer day. Also, she said, leopards are "kind of sly." "It could have been a threat, especially for a small child," Carpenter said. "[Zeya] is not a very aggressive cat. ... There are cats [with which] you know you don&apos;t have a chance." Hansen said it was fortunate that Zeya escaped early in the day, when fewer people are at the zoo. Visitors said staff quickly ushered them into gift shops, cafes and animal-viewing buildings. One preschool group hid in a women&apos;s bathroom. Visitor Diggy Hicks-Little said she was in the small-animal building, watching zoo employees wielding brooms and mops as they hustled visitors indoors; Hansen said the staff is trained to grab any available defensive object when an animal escapes. She added that the zoo routinely performs drills, and visitors should simply follow instructions and not assume a deadly threat is at hand if they hear "Houdini" mentioned on the grounds. Hansen said the code was invoked when a wolf escaped her pen in May 2006. Jennings said everyone around her appeared calm and that she wasn&apos;t frightened even when she found herself and her 3-year-old daughter standing, with no barrier, near a leopard. "It just really looked like a cat hanging out," Jennings said. "It didn&apos;t look threatened. I wouldn&apos;t say I was scared. I was more ... interested." 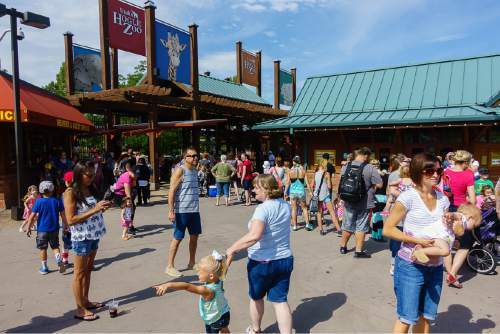 Several other visitors lauded the efficiency of the zoo&apos;s lockdown, though some expressed misgivings in the Asian Highlands area, where several big cats are housed. Michelle Swensen ushered several children past the empty leopard enclosure on Tuesday afternoon, assuring them: "Everything is safe." "Unless a tiger gets out," retorted her 10-year-old nephew Nickolas Pozzuoli. Zeya&apos;s neighbors in the Asian Highlands reacted strongly to her escape, visitors reported. Jennings&apos; friend, who spent the lockdown in view of the lynxes, described their behavior as "really anxious." And Jennings recalled that before she found the leopard outside its enclosure, she and her daughter noticed the tiger "panting and pacing back and forth" on a bridge that overlooks the leopard exhibit. "The cats would have seen what was going on," Carpenter confirmed. "One of the tigers watched the whole thing." 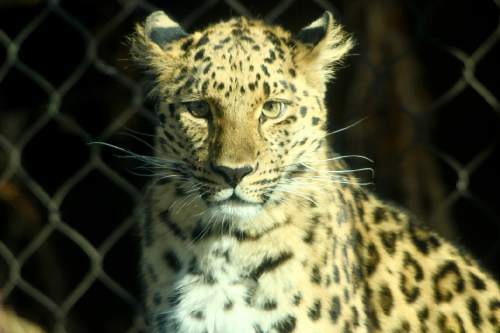 The zoo has five leopards  three snow leopards and two Amur leopards. Amur leopards  it is estimated there are fewer than 40 of them in the wild  are known for their long, spotted coats and long legs. They can reach speeds of 36 mph for short distances and leap 19 feet horizontally and 10 feet vertically, the zoo&apos;s website notes. 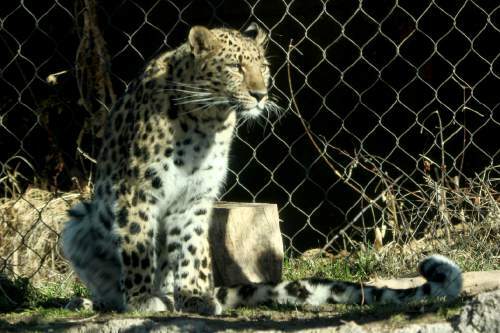 Zeya went to the zoo as part of a breeding program for Amur leopards. Her intended mate, Dmitri, only has contact with her when she is in heat, Carpenter said. Until the leopard enclosure is cleared for security, Dmitri and Zeya will remain in separate holding areas out of public view, Hansen said. While brief, the escape quickly generated a "Hogle Zoo Leopard" parody account: @HogleZooLeopard. "Do you think I can get tickets for Cavalia? I&apos;d love to eat-i mean watch horses," one Tweet read. "Anyone know where I can buy a giant ball of yarn? Like, Costco sized?" another asked. And, finally, there was this one, regarding the tranquilizer dart: "Is that what that was? I thought a bee stung me."